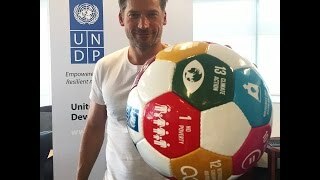 In his role as UNDP Goodwill Ambassador, Danish actor Nikolaj Coster-Waldau, best known for starring in HBO’s Game of Thrones, focuses on raising awareness and support for the Sustainable Development Goals. Also known as the Global Goals, they are a universal call to action to end poverty, fight inequality and stop climate change. “My main mission as UNDP Goodwill Ambassador will be to raise awareness and support for the Global Goals for a better future for all, which cannot be achieved without empowering women and protecting our planet,” said Coster-Waldau at a press conference held at UNDP headquarters. Father of two girls, Coster-Waldau is passionate about ending discrimination and violence against women and girls everywhere. He is focusing on drawing attention to critical issues such as gender equality and climate action to encourage people to be agents of change. In addition to his award-winning acting career, Coster-Waldau is also a producer and screenwriter. After graduating from the Danish School of Theatre in Copenhagen, he received his first major film role in Nightwatch in 1994, a critical and commercial success in Denmark. He has since starred in various films in Europe and North America, including Gods of Egypt, The Other Woman and 1,000 Times Good Night. Check out some of the actor's compelling video messages in the video section below. 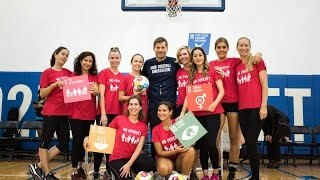 In his role as UNDP Goodwill Ambassador, Nikolaj Coster-Waldau focuses on raising awareness and support for the Global Goals, especially gender equality and climate action.